You've seen 'em. Those little workbenches that sell for $10-20 at Autozone. They seem so flimsy, right. They're one of my favorite tools. I've used them for years for everything from a painting table to assembly, sanding, planing, etc etc etc. They get pretty abused and the crappy particle board tops always break after a while. Then, as soon as they're on sale for under $20 somewhere, I get another one. 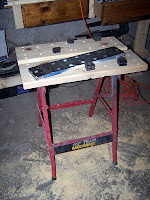 But I realized when my current one snapped that the metal frame and clamping system work just fine. Why toss the whole thing when all it needs is a top? Then I started thinking about improving it. (Uh oh.) Luckily all I could think of was to make the top a little larger. Whew. That could have gone bad. Some of the 2x12" boards I had scavenged off a waterbed became the new top. I started working those boards to use for shelving, but they were too warped. Of course I noticed that AFTER putting a nice profile on the edges. So that is just a little bonus for me when I used them here. I cut them to 30" long, jointed the edges that meet to keep them parallel, and laid them on the garage floor. 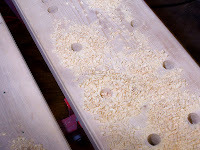 After unscrewing the particleboard tops from the table, I flipped it over and lined up the mounting brackets. That was easy. The hard part was getting the dog holes. 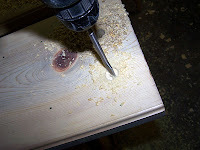 I laid out a pattern I liked and hit the table with my B&D 18v cordless and a 3/4" spade bit. This took a while because the bit would get pretty hot after 2 holes, so I let it cool before moving on to protect the edge. But the spade cut this old yellow pine nicely. I was afraid I'd have to find the box with my hole saws, but the spade did so well I didn't bother. After the holes were drilled, and I checked the fit of the plastic dogs I've been collecting from all the tables I've bought over the years, I got up and stood on it to test its strength. Perfect. 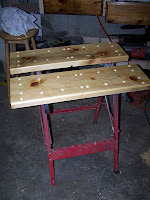 The pic below shows the assembled and drilled top with one of the old top halves. The other half is the one that snapped. You can get an idea of how much bigger I went with my new top. I finished it with just a few coats of Butcher's Bowling Alley Wax. I love this stuff and use it on anything that might have some wood content. The feel of the wood after application is amazing. Silky smooth. I use it with poly, shellac, or in this case bare wood. 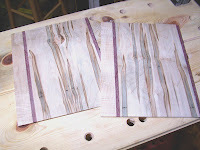 They're bookmatched ambrosia maple, edged in purpleheart, with tiger maple on the left edge. I can't wait for the finish!! !